Many homes have a basement in them, and whether space is livable or not, it typically ends up being the area where people store their extra items. However, this is the area in the home that is in most danger of flooding, especially in a storm. So if you have a home with limited storage space, how can you keep your belongings safe? Here are a few tips for storing your things smart so you won’t lose too much from possible water damage. You should never store your items straight on the floor. For example, if you have food storage items like a bulk bag of flour, you should not just lay that on the floor of your basement because flood water could easily destroy the paper bag. Not only this, but weevils or other bugs can easily get in. If you are using your basement to store food, you should always put it in sealed containers. You can use large bins you find at any container store or you can even use garbage bins that have a closing lid if you have a lot of food storage items. You should always have your items in a container. Shelves in the basement can keep all your things organized and they can also protect your items. Every inch higher you can keep your belongings will help in a flood. One thing to consider is anchoring your shelves to the wall. If they are unanchored, and you move items up further on the shelf to avoid contact with water, it could become unstable and fall over. It’s also a good idea to always anchor your furniture if you have children who will sometimes try and climb it. Another good tip is you should seal your basement before you start storing anything down there. If you have cement walls and floors that are basically the foundation of the home, you should seal them up to keep moisture from coming in and damaging your items. You can buy basement sealant for a reasonable price at any home improvement store. This is also a necessary step before you finish your basement if that is in your plans. One of the most heartbreaking things is when photos are lost in a water damage disaster. If you have items that are absolutely irreplaceable, the basement is not a place for them to be. Basements tend to be damp and dank, and if this is the case for you, it could ruin some of your photo prints if you have any. The moisture in the air can cause the photos to stick together and eventually rip or change color. Technology also does not do well when put in contact with moisture. So if you have any extra printers, computers, or anything similar that you aren’t using regularly, store them upstairs in a closet instead. If you were to have a flood today, how much of your storage items could you carry to safety by yourself? It is always a good idea to store items in boxes that are small enough that you can lift and carry them. If you have a large box full of heavy things, it will take many more trips up and down stairs to transport it in the event of a flood. You can also call your local water damage cleanup professional for more tips to keep your belongings safe. 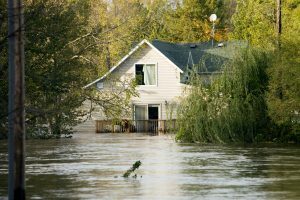 If a flood disaster does happen to your property, contact your local water damage remediation professionals in Southern Maryland. Regional Property Group has the skills and expertise to quickly remove any standing water in your basement, dry affected areas, and restore your property to pre-loss condition. Our team is available 24 hours a day, 7 days a week so that we can be there when you need us!